Added on 05 June 2018 . By Sarah Bartlett. Walking along Leeds’ Park Row you’d be forgiven for not taking a second glance at the iron railings and unobtrusive signage that forms the entrance to Argentinian steak restaurant Gaucho. But take a second look and you will find one of Leeds' best steak spots, an underground restaurant that’s not to be missed. Step below street level and the space expands like wonderland, bringing a true taste of ‘The Pampas’ to the UK. Forget the stone greys and filament bulbs that decorate urban Leeds; stepping into Gaucho is like being transported to another world with its low-hanging chandeliers, plush carpet and floor-to-ceiling cowhide. 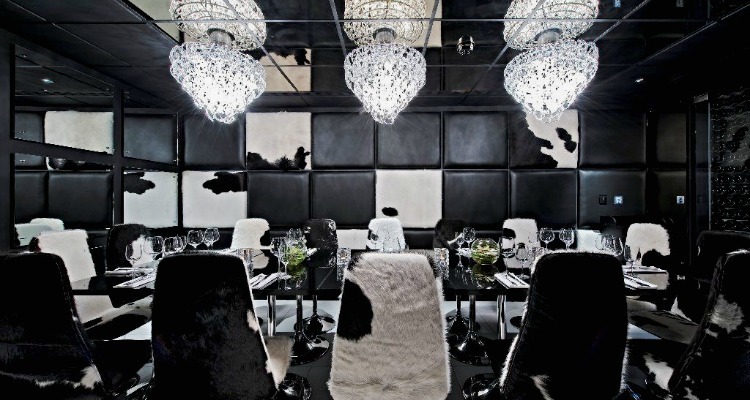 In fact, there's hardly any colour in the spot, with a monochrome theme mirroring that of a cow - even the decor pays homage to beef at this stylish joint. 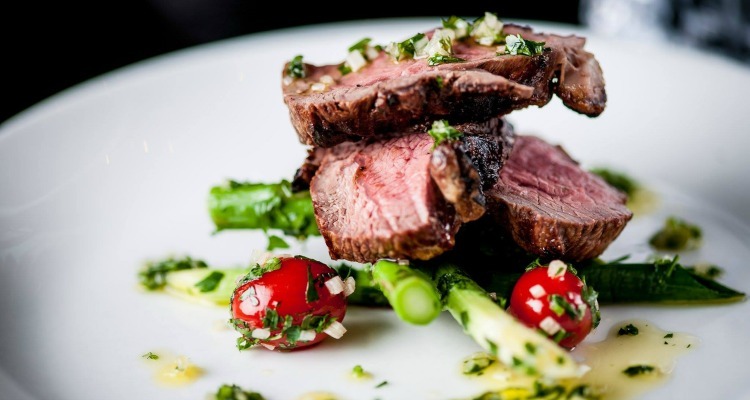 Luxurious yet authentic, the restaurant goes above and beyond other steak houses in Leeds. Luxurious from the horn to the hoof, Gaucho is a temple to all things cow. We were seated at a table in view of the open kitchen and immediately brought water and our menus, along with some warm cheese bread and homemade chimichurri dressing. The wine menu alone is pages long and filled with the best picks from Argentina’s finest vineyards, so you’ll be thankful for the waiting staff’s expertise. After a few tasters, we opted for a deep Malbec, the Colome Terruno de Gran Altura (£59), originating from the world’s highest vineyard and served in glasses designed exclusively for Gaucho - talk about swish and delish. It’d be sinful to come to a restaurant famed for its Argentine steak and not get sight of the ‘meat board’, a solid wood slab decorated with prime cuts of free-range, Aberdeen-Angus beef. Each was expertly explained by our waitress who was well-versed in the forms and flavours. Lomo, Ancho, Chorizo and Cuadril are your choices, with tasty twists such as smoked garlic, parsley and chimichurri offering variations on your typical fillet, ribeye, sirloin and rump. To start, we opted for the Crispy Soft Shell Crab (£9.95) with chimi slaw, tangy mango ginger dressing and sprinkled with juicy pomegranate seeds that provided a sweet burst against the coriander garnish. We also tasted the Salt Beef Crostini (£9.95) which sat underneath fresh tomato salsa, a perfectly poached egg and tangy horseradish cream, a far cry from the market stall salt beef bagels we’re used to! Gaucho aims to bring the finest Argentine steak to Leeds. Chances are you’re going to order steak here, though they do have dishes to tempt seafood or chicken lovers if you fancy. We chose the Churrasco de Lomo (400g, £50), a variation of fillet which is spiral cut and marinated in garlic, parsley and olive oil. The best thing? You don't need a steak knife, it’s that tender and simply melts in the mouth against the zingy marinade. We also opted for the Ancho (300g, £26.50) which is a delicately marbled ribeye with a mature, more traditional ‘meaty’ flavour. Thin or fat chips (go fat - twice cooked!) are served on the side, and you can order additional dishes at £4.95 a pop. Mixed Beans (sugar snap peas, mangetout and French beans sauteed with shallots, garlic and capers) and the Rocket and Kale Salad (with Parmesan and pumpkin seeds) were our choices. This, by the way, was A LOT of food - you could get away with sharing a chips and other side. Sauces are also extra at £3, but I’d definitely recommend the Salsa Verde. I wouldn't be doing it justice if I didn’t recommend you at least taste the Dulce De Leche Cheesecake (£9.95). Served hot, this beauty is served with warm, salted dulce de leche and a TOASTED, gooey marshmallow. If you’re too full to fit in dessert (but please do try…), there is the option of a sweet cocktail (or ‘digestif’ if you’re fancy). We tried the Banoffee Old Fashioned (£10.85) which is Bambu rum over ice with banana sugar, chocolate bitters and dulce de leche. Close your eyes and sip, with those tropical flavours you could be in the Caribbean. 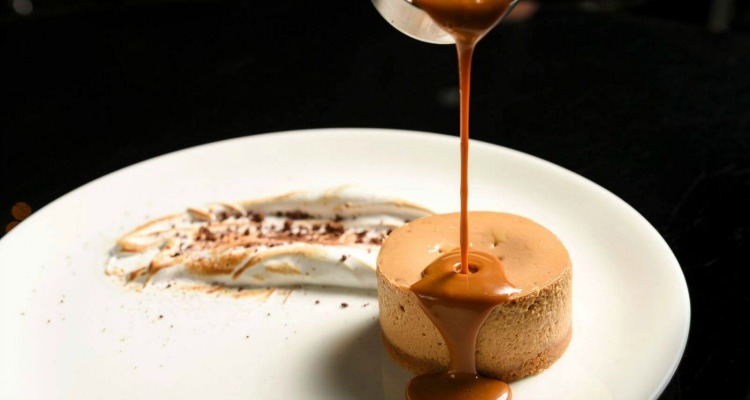 Completely decadent but worth every bite, the Dulce De Lece Cheesecake is the only way to finish a meal. Let’s state the obvious here, Gaucho is pricey. But, the right occasion with the right dining pals (preferably just after payday) and you’ll be set for an evening of divine decadence, Argentina style. Or, swing by on your lunch break and enjoy three courses for £27.50!